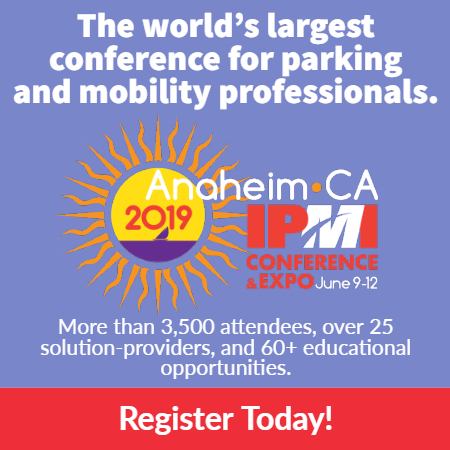 Some parking facility owners and operators believe that as long as their structures continue to serve the public, few maintenance-related tasks need to be performed. Nothing could be further from the truth—facility maintenance is downright essential. One of the most important things an owner or operator can do to extend the life of a parking structure is formulate and implement a proper maintenance plan. Case studies of three different parking garages in Pennsylvania clearly demonstrate that ongoing maintenance programs minimize repair costs. 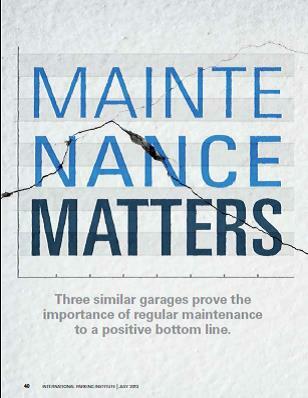 In fact, well-maintained garages have significantly lower annualized repair costs, while repairs for lightly-maintained garages cost operators and owners two to four times as much (on an inflation-adjusted basis). All three Pennsylvania garages investigated were built in the early 1970s. They were all designed by the same design firm and all experienced similar weathering. The primary difference between the three garages was the extent of known maintenance. To easily identify the facilities, they will be referred to by their geographic location within the state: Eastern, Central, and Western. The lightweight concrete has poor freeze-thaw durability, which is partially offset by significant floor drainage slopes throughout most floor areas. Where drainage slopes are minimal, the slabs exhibited significant freeze-thaw damage. The P/T tendons are 7-strand wire protected by plastic sheathing with minimal concrete cover (less than 3/16 of an inch). This was between the driving surface and the tendons where they crossed above beams. This thin concrete layer wore through in a number of locations, leaving the tendons vulnerable after the plastic sheathing also wore through. At locations where the sheathing had worn away, the tendons corroded and then broke. Perimeter walls consist of either concrete or clay hollow cell block similar to—but only half the height of—common concrete block (CMU). In the Eastern and Central garages, every other cell was grouted solid, while in the Western garage, all cells were grouted solid. The Eastern and Central garages sustained significant damage from having water trapped in the un-grouted (empty) cells. This was from water slowly saturating the concrete and tendons beneath it. The Western garage had supplementary slab rebar to provide a safety mechanism for tendon failure. When these rebars corroded, they became a significant deterioration mechanism as well. Constructed in 1973, the Eastern garage is a 420-space, five-level facility. The garage’s maintenance history was unknown, but appeared to consist of light maintenance (primarily repairing exposed broken slab tendons and installing weep holes into perimeter masonry walls to alleviate water storage within the ungrounded cells). During the investigation, the garage’s critical issues were extensive perimeter wall and slab edge deterioration on the upper two levels (due to water saturation from the perimeter walls’ ungrouted cells), localized slab P/T tendon breakage above beams, chloride-contaminated concrete, and brittle joint sealants. Constructed in 1972, the Western parking garage is a 300-space, four-level facility. The maintenance history was unknown, but appeared to consist of light maintenance (primarily removing loose concrete and patching of spalls). This garage received a unique vertical expansion down into the soil beneath a portion of the facility (to make room for a 10,000-square-foot bus/train waiting area). During this project, a traffic-bearing, waterproofing membrane was installed above the waiting area and joint sealants were replaced. During the investigation, the garage’s critical issues consisted of extensive slab freeze-thaw damage at roof-level flat areas, freeze-thaw damage to numerous beam and slab edges, localized slab P/T tendon breakage above beams, extensive rebar corrosion and concrete spalling over the top of beams, chloride contaminated concrete, brittle joint sealants, and a worn-out membrane. Constructed in 1973, the Central garage is a 490-space, five-level facility. This garage was judged to be in fair condition, except for a 5,500-square-foot portion of the roof level where minimal floor drainage exhibited a significant number of broken slab P/T tendons. The known maintenance history consisted of two sets of structural and waterproofing repairs, as well as architectural renovations (the original perimeter wall was replaced with a brick-faced concrete wall). During the investigation, the garage’s critical issues were the extensive P/T tendon damage at flat areas of the roof level, moderate slab edge deterioration due to water leakage through the original perimeter wall and then through the brick façade, chloride contaminated concrete, and brittle joint sealants. Detailed here are the structural repair options along with costs and lifespans for the garages. Excluded are non-structural costs included in the final repair options’ costs. These, while real, varied greatly by client preference and constraints. These non-structural costs included lost revenue; construction management fees; design fees and contingencies; and lighting, elevator, parking equipment, and occupied space upgrades. Structural repair option costs include structural repairs and waterproofing to protect the structural repairs. Unless specifically noted, all repair options were designed to allow for another life extension at the end of the proposed repair (See Figure 1 for details). The Eastern garage had several proposed repair options: one-year life extension at $139,000; five-to-10-year life extension at $1,223,000; 20-to-30-year life extension at $2,216,000; and replacement with a new garage with a 45-year-plus lifespan at $6,506,000. The Western garage had these proposed repair options: three-to-five-year life extension at $889,000; seven-to-12-year life extension at $1,262,000; and 15-to-25-year life extension at $1,855,000. No replacement option was desired based on the anticipated lack of future additional parking demand and the resulting inability to recoup the large costs of a new facility. The Central garage had these proposed repair options: three-to-seven-year life extension at $253,000 (this option required demolition shortly past year 10); five-to-10-year life extension at $684,000; 12-to-15-year life extension at $882,000; 14-to-19-year life extension at $898,000; 15-to-20-year life extension at $1,624,000; and replacement with a new garage with a 45-year-plus lifespan at $4,788,000. The repair options presented different challenges to each garage owner. Owners typically look at monetary factors such as total cost, length of life extensions, and the remaining durations of outstanding bonds, as well as non-monetary considerations that include the political environment and anticipated future parking demand. Newer parking garages often have significant annual bond payments as compared to revenues, while older garages with small or no annual bond payments provide strong cash flow to subsidize other newer garages or the entire parking system. New parking garages rarely provide significant positive cash flow because they compete with much cheaper on-street parking (which is generally paid for with either gasoline excise or property taxes) and are provided as a public service with no intent of generating significant positive cash flow. It’s recommended to owners that when analyzing monetary factors, one should look primarily at the annualized cost effectiveness—or the ace—which is defined as cost-per-space per year (total cost divided by number of spaces divided by the mid-point between the anticipated lower and upper repair life spans). Owners are also urged to look at total cost. The ace highlights the relative cost effectiveness of each option, while the total cost highlights total funding needs. Total cost often influences the political consequences of requesting funding and interacts with the anticipated likelihood of future parking demand and the current political will to fund anticipated future parking supply. The Eastern garage had four options presented, with a 20- to 30-year life extension being the most cost-effective. The facility’s owner decided that additional parking demand was necessary for community growth. A demolish-and-rebuild solution was chosen: Minimal garage repairs were made to maintain safety until the facility was demolished and a new 680-space, seven-level garage was built with a construction cost of approximately $12.1 million. The Western garage had three options, with a 15- to 25-year life extension being the most cost-effective. The owner chose the life extension based on its cost effectiveness and a low anticipation for future parking demand increase. The owner then proceeded with small repairs until funds became available to repair the garage in three phases. Construction costs totaled just less than $2 million. The Central garage had six options presented, with a 14- to 18-year life extension being the most cost-effective. The owner chose the life extension based on its cost effectiveness, as future parking demand—while anticipated to increase—was uncertain as to the rate of growth and there was time before a new facility was needed. The garage was repaired in one phase with a construction cost totaling $1.5 million. A new 525-space, six-level garage with 20,000 square feet of retail was built several blocks away. The construction cost was $11.1 million. Due to the effects of inflation on pricing, the U.S. Department of Labor’s Bureau of Labor Statistics numbers were used to translate the ace pricing from each investigation into October 2012, prices. Figure 1 compares repair options with the translated ace pricing. Figure 2 shows the translated ace costs versus option lifespan for all three garages. The garage with the known comprehensive maintenance history had the most economical ace. 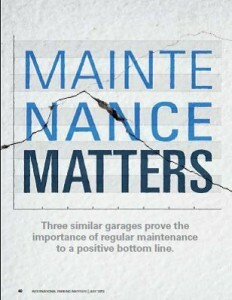 The garages with apparent little maintenance history had ace that was typically two to five times as expensive for similar lifespans as the comprehensively maintained garage. Shorter term repairs typically have smaller total costs but also are less cost-effective (have higher aces) in extending the lifespan of a facility. There is typically an optimum repair scenario that extends the lifespan most cost-effectively. New garages are typically not the most cost-effective way to continue to provide structured parking supply, but it is difficult to accurately compare costs. It’s particularly difficult to project maintenance costs throughout a new garage’s lifespan, as this will significantly change the ace for the option. There is also difficulty in direct comparison because new garages often have non-mandatory items (such as faster elevators, surveillance equipment, emergency power systems, and better durability resistance) and mandatory items (more robust earthquake resistance) that simply did not exist when these garages were built. Other non-monetary issues that may be considered important are that new garages may be politically more acceptable than repairs, because old, repaired garages often appear similar to the general public when compared to their pre-repair appearance; newer features can be added; and few people may notice the increase in annual bond payments. An interesting note is that the parking efficiency—the square feet per car—(which is set at the time of construction) affects maintenance costs. The Western garage has about 12 percent more square feet per car. Since every square foot must be maintained and repaired, the facility’s costs are 12 percent higher due to is configuration based on “per space” repairs. Parking facilities differ from most buildings because, like bridges, they are subject to weathering, large thermal cycles, and de-icing salts. To counteract these factors and cost-effectively prolong their lifespan, a carefully planned and monitored maintenance plan will minimize the total cost of ownership. Gregory J. Neiderer, PE, is mid-Atlantic department head at Walker Restoration Consultants. He can be reached at greg.neiderer@walkerparking.com.